As a Special Commission by the Edinburgh Art Festival and part of Ruth Ewan’s Sympathetic Magick, I wrote, produced and performed this show in the Edinburgh Festival Fringe 2018 at The Pleasance Courtyard and Palm House. ‘Madness: Reality or Illusion?‘ is a thought provoking entertaining exploration of what is real and not real; how do we know and who decides? 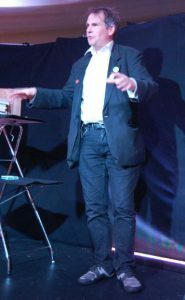 Drawing on my background in mental health, magic and spirituality, I invite the audience to consider these questions and more, illustrating my musings with magic tricks, stories and experiences as a mental health nurse.